I completely removed the leather from the handle. I removed the mekugi from the wooden handle and slid the handle off of the tang. This was easier than I expected. No damage was done. 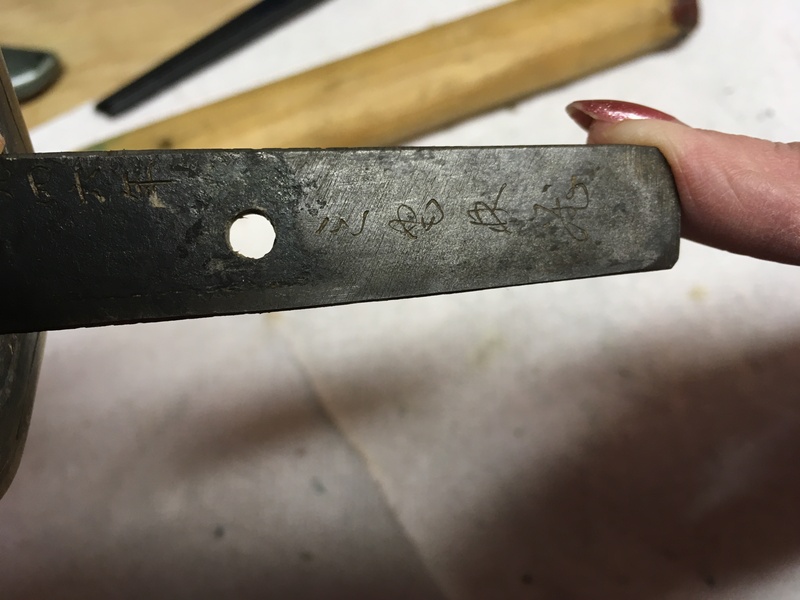 This revealed two inscriptions on the tang, one set of characters near the grip and one set near the end. I have attached 7 pictures of these inscriptions from various angles. It was difficult to tell exactly what the lighting was as I was taking these pictures. I will try again if these are not adequate. Sorry they are not better. Please tell me what you can from the writings on the tang and thank you again very much for your time on my behalf! #1Submitted by saipan59 on Mon, 2018-02-19 02:05. Hi, This is mostly good news. It's interesting/unusual. 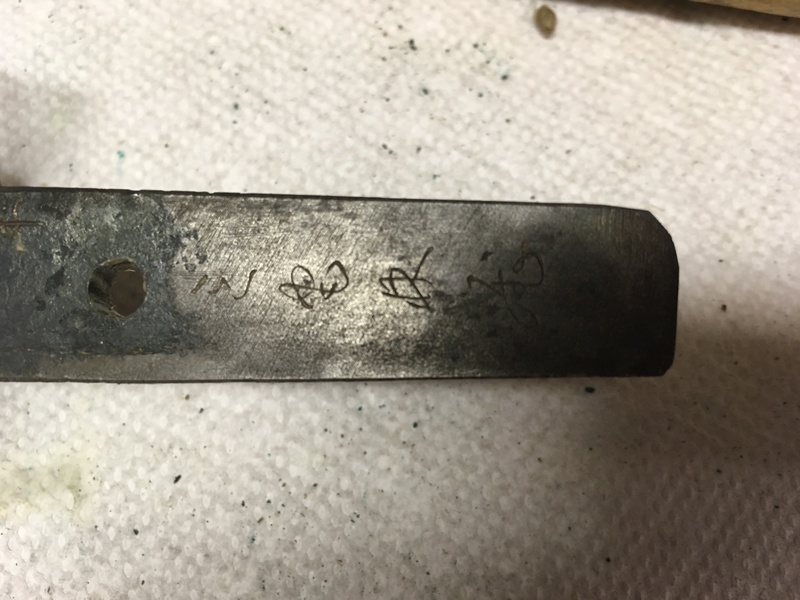 The upper inscription (near the handguard) says "1946 year", written in normal kaisho-style kanji. The lower inscription is probably the "art name" of a swordsmith. It is written in sosho style, which is very difficult to read (for someone like me) - it is done in a style that resembles traditional brush writing. I'll see if I can figure out any of the 4 characters. The last two are the most important, because they would be the main part of the name. Here's my BEST GUESS of what we have here. Note how the area with the signature has been filed fairly smooth, but you can see the "yasuri-me" (file marks) that angle up to the left (referring to image "tang4" at the moment). Now look at the area above that, around the hole and such. Note how it is rough and pockmarked, and a near-black color. This is what a very old tang looks like. Iron rust, when fresh, is the familiar reddish color. But after 100's of years, it stabilizes to a near-black color. So, most likely the sword was originally "mumei" (unsigned). 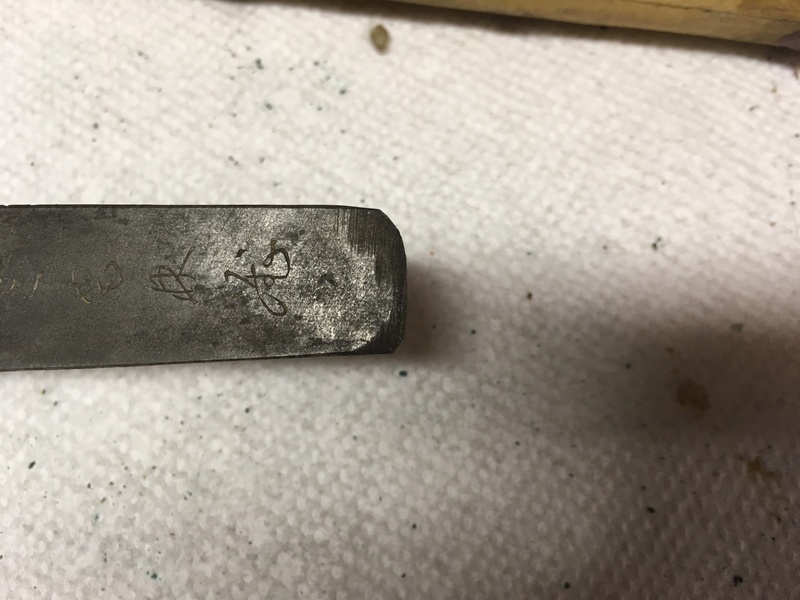 But the owner knew who likely made it (an expert can determine this, it is called "kantei"). Someone had an artisan inscribe a signature to match. This was likely done in 1946, and they dated their work with the upper inscription. The blade MAY be in the 400-600 year old range, but that's pretty much a wild guess at this point, based on the old patina of the tang. 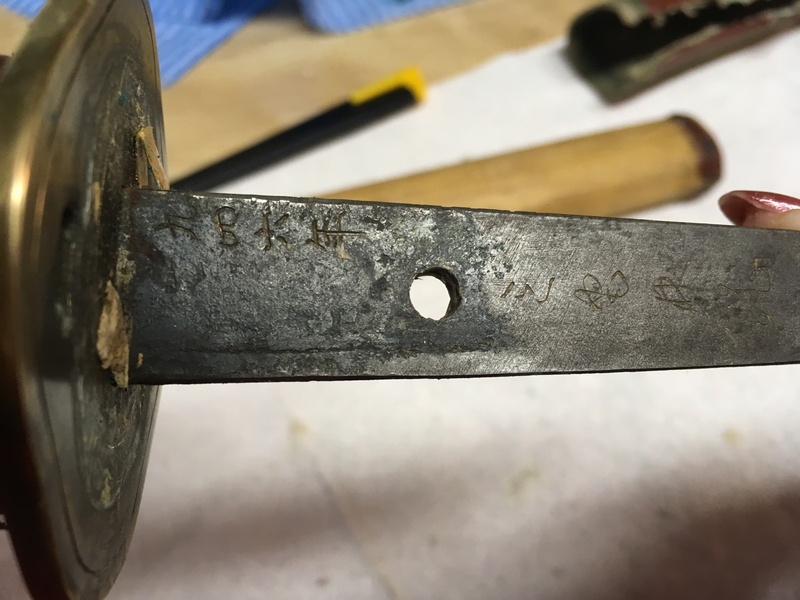 The tsuba (handguard) was probably made at the same time (1946), along with the leather cover to protect the old wood (the wood is probably not as old as the blade, but it's hard to tell. 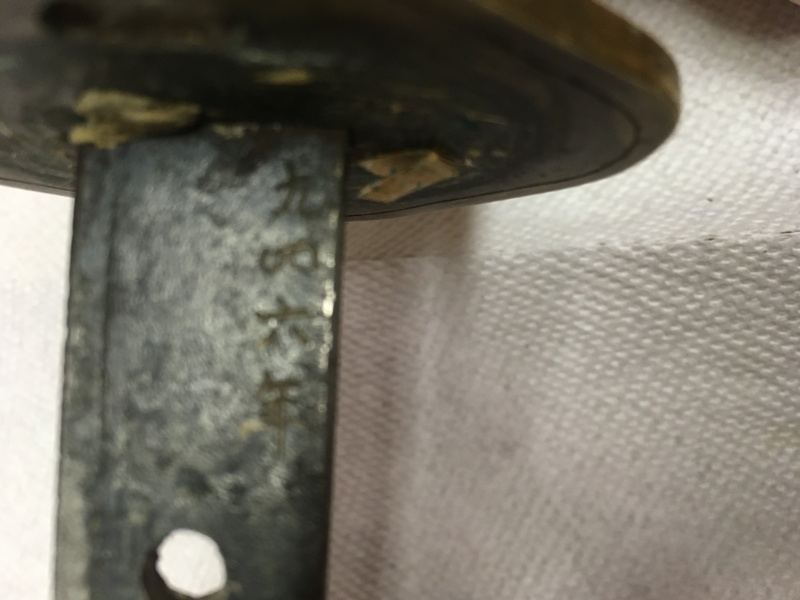 It would be normal for the wood scabbard to be replaced when necessary, over such a long time period). 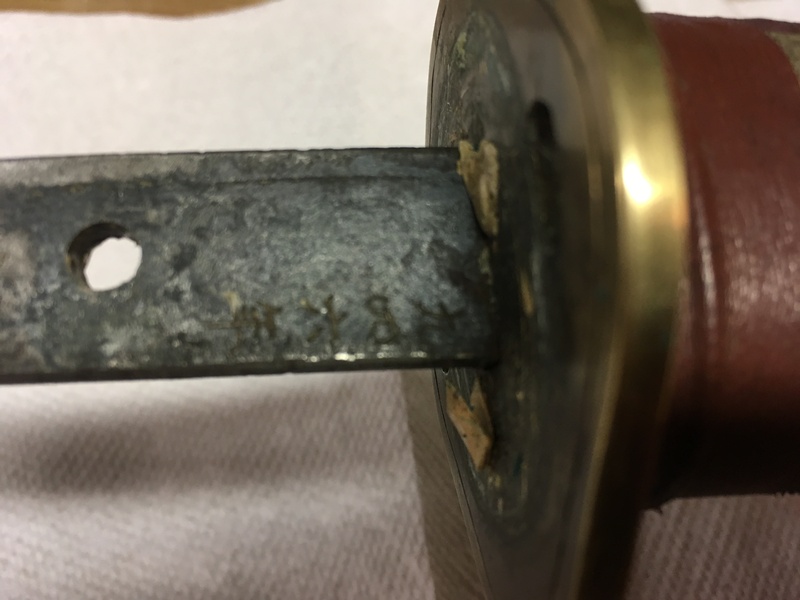 The odd inscription on the tsuba could be someone's "social commentary" about the unfortunate effects of war, etc. Just a guess. Remove the tsuba, and the habaki (the metal collar on the blade, next to the tsuba), and post some more pictures of just the blade. If the habaki is too difficult to remove, leave it on. - The tip of the blade, the last 2-3 inches. - The center area of the blade. 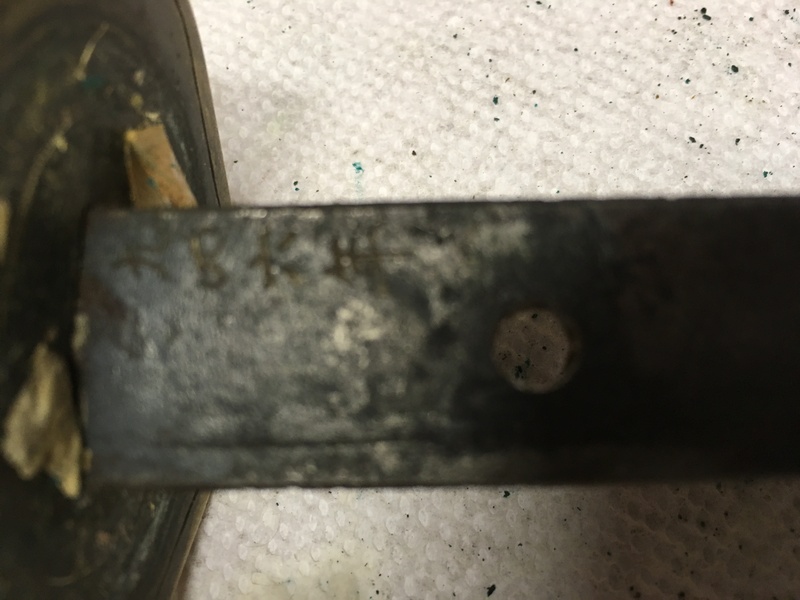 - The area centered on where the tsuba would be, about 2" on either side of the tsuba. With the habaki removed, if possible. Also, if it were mine, I would remove all the leather from the handle and scabbard. BTW, do not "clean" or "fix" any part of the metal blade. Do not use any type of abrasive. It is correct to handle the tang of the blade with your bare hands, but do not touch the main part - the salts and oils in your skin will lead to rust damage. If there is any "crud" or modern fingerprints on the blade, try to clean it with a soft cotton cloth (flannel is good) and a few drops of high-quality gun oil. Do not use "motor oil", or any type of cheap oil. A very thin film of oil will discourage rust or corrosion in the future. #2Submitted by saipan59 on Mon, 2018-02-19 03:22. My wife thinks the first part of the name is "Masakame". #3Submitted by GoinSword on Tue, 2018-02-20 18:59. Thanks, I will try other sources also for the translation and hope you can keep trying on the second part. Does Masakame have a significant meaning? #4Submitted by saipan59 on Tue, 2018-02-20 21:15. In this context, "Masakame" is just a person's name, such as Tanaka or Suzuki. It would NOT be a European-type "first name", but rather a family name. It MAY be the smith's true family name, because the second half would normally be the smith's "art name" (similar to a pen name). It MAY be a place name instead, or in other cases it could be a historical clan name (but those clan names are well-known, and Masakame isn't one of them). The art name is what would be listed in reference books, etc. I did a quick Google to look for Masakame in the context of Japanese swords, but didn't see anything. It's also possible that Masakame is not the correct reading for these two kanji characters. "Masakame" is a "kunyomi" reading. But in an "onyomi" (Chinese-based) reading, it could be something like "SHOuKI" or "SEIKI" or "SEIKIN", etc. You can try googling with these other spellings, and maybe get lucky.